"Our effort with this festival is to raise awareness and appreciation in Orange County of the amazing subtle impact that contemporary African American culture continues to make on all our lives as Americans, from the way we walk and talk, to the way we view the world. It's positively infectious," stated Nicole Mitchell, UCI professor of music and faculty organizer of the festival. "Let's celebrate it! " The two-day festival features a coalition of prolific artists, musicians, composers in both traditional and new media. Guests artists include Geri Allen, Tatsu Aoki, Tatsu Aoki Miyumi Project, Michael Dessen, d. Sabela Grimes, George E. Lewis, Nicole Mitchell, Fred Moten, Eagle Nebula, Avreeayl Ra, Ras_G, Melody Takata, and Edward Wilkerson Jr. Each day the artists will focus on the relevant topics in the African American culture and beyond. 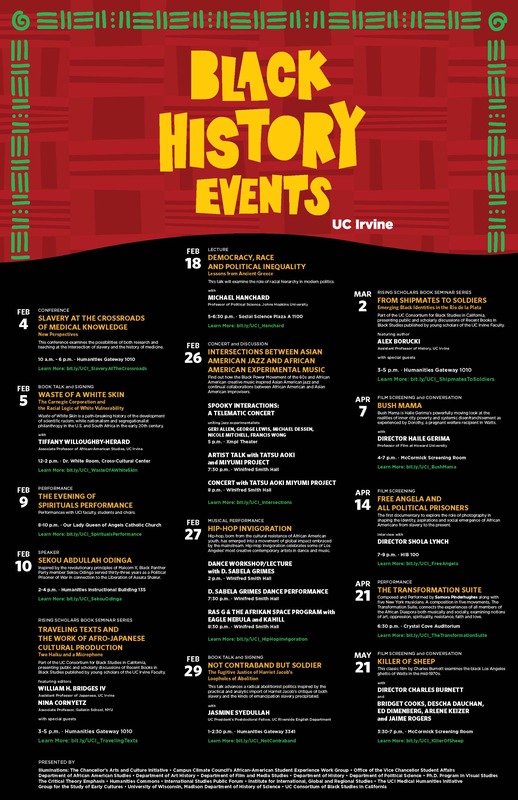 Friday, February 26, 2016, will feature “Intersections between Asian American Jazz and African American Experimental Music.” Find out how the Black Power Movement of the 60s and African-American creative music inspired Asian American jazz and continual collaborations between African American and Asian American improvisers. The highlights include “Spooky Interaction,” a telematic concert, by George E. Lewis and concert performed by the Tatsu Aoki Miyumi Project. Saturday, February 27, 2016, presents “Hip-Hop Invigoration.” Hip-hop, born from the cultural resistance of African American youth, has emerged into a movement of global impact that is now embraced by the mainstream. Hip-Hop Invigoration will celebrate some of Los Angeles’ most creative contemporary artists in dance and music. There will be two events including a dance workshop/lecture and performance with d. Sabela Grimes and a third concert with Ras_G & the Afrikan Space Program with Eagle Nebula and Kahill Sadiq. All events are FREE and open to the public. Individual event registration may be found on the event page at the website www.arts.uci.edu/calendar OR music.arts.uci.edu. For more information, and directions to the venues, please visit www.arts.uci.edu. Find out how the Black Power Movement of the 60s and African American creative music inspired Asian American jazz and continual collaborations between African American and Asian American improvisers. “Spooky Interaction,” by George E. Lewis, a telematic concert featuring George E. Lewis (trombone) and Geri Allen (piano) at the University of Pittsburgh; Nicole Mitchell (flute) and Michael Dessen (trombone) at UC Irvine; and Francis Wong (saxophone) at the San Francisco Jazz Center, along with two virtual improvisers designed by Lewis performing via disklaviers in Pittsburgh and Irvine, and visual design at UCI by John Crawford. Tatsu Aoki (taiko, shamisen, bass), Edward Wilkerson Jr. (tenor sax), Avreeayl Ra (drumset), Melody Takata (taiko and percussion). Hip-hop, born from the cultural resistance of African American youth, has emerged into a movement of global impact that is now embraced by the mainstream. Hip-Hop Invigoration will celebrate some of Los Angeles’ most creative contemporary artists in dance and music.